hmmm.. something about myself...i luv watching anime,luv cats,like to sit on top the balcony, chocolate,milk,fish,angels,crosses,anything that seems interesting. a bit lazy,hyper,crazy at times and have a wild imagination!lol and like to draw... thats all i can think of right now. Train Heartnet is the main character in the anime and manga versions of Black Cat. 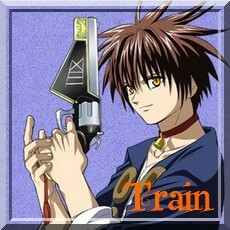 When we first meet Train he is a merciless assassin working for the Chronos organization as one of their Numbers. His most famous name is Black Cat, so named because of his assigned number 13, quick, stealth movements, and because he "brings bad luck" to every target. However, one night on his rooftop, Train meets a sweeper named Saya Minatsuki. Saya introduces him to ideas of using a gun not to kill, but to protect. When Train encounters, and is ready to kill, his target, he recalls her words and does not shoot. Afterwards Train leaves Chronos to become a sweeper alongside Sven and Eve. He is recognizable by his red choker with a bell, the tattoo of the Roman Numeral XIII on his chest, his spiky brown hair, and his gun, Hades. Train's personality is of that of a "stray cat": he follows no rules and has his own way of life, constantly speaking about how he has been reborn as a stray and works for no one. Train has spectacular fighting and shooting skills, loves milk, and always seems to be hungry. thankyou for visiting come back soon! Login or register to add black cat as your friend!